Fifteen private higher secondary schools out of 21 in the country have agreed to accept students in class XI on government scholarship at a negotiated rate. The Education Minister Jai Bir Rai at Friday Meet Press session said the government will provide a scholarship of Nu 50,000 each for boarding students and Nu 30,000 for day scholars. Of the 12,033 students who passed class X examination, the government higher secondary schools will absorb 7,808 students. The remaining 4,225 students will be admitted in the private higher secondary schools with a full scholarship from the government. 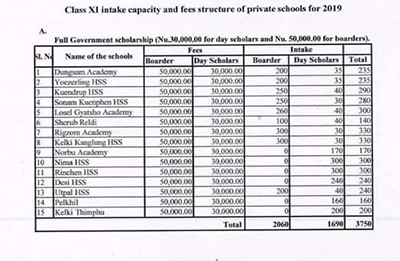 The Education Minister J.B Rai said 2,060 students will be admitted as boarders and 1,690 students as day scholars. For the 475 students, he said they are keeping the options open, as the government wants the six other private schools to participate as well. He added should these students opt to study in these private schools, the government will provide the scholarship of Nu 30,000 while students have to bear the remaining amount. 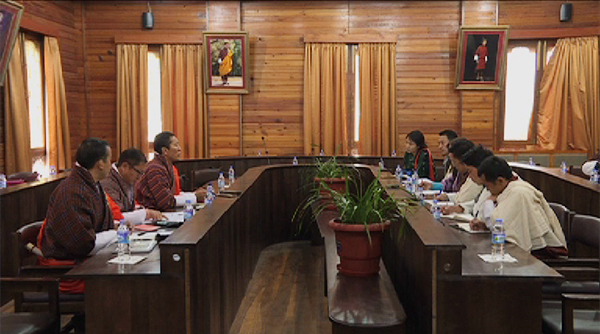 Prime Minister Dr Lotay Tshering said they respect the decision of those private schools who did not agree to admit the students at the discussed rate. The government says students’ eligibility to get boarding facilities will be decided by the respective Principals and Dzongkhag Education Officers based on the economic background of the students. Some of the conditions for the scholarships are once admitted in a school, the student shall not be allowed to change the school unless they do so at their own expenses. And if a student refuses to go to a boarding school identified by the Ministry, government scholarship will not be provided to the student. Also, if a student on government scholarship fails in Class XI or XII, he/she will not be eligible for a government scholarship to repeat. The students have to start registering with the respective identified schools from February 8 and registration will close on February 20.